Since time immemorial, humans have strived to reach the heavens with epic feats of engineering and architecture. The Great Pyramid of Giza, Cologne Cathedral, the Eiffel Tower, the Empire State Building … each of these once called itself the world’s tallest structure. Today, that honor belongs to Dubai’s Burj Khalifa – a 160 story testament to human accomplishment, ingenuity and resolve. Bursting out of the desert like an oasis of glass and steel, Dubai’s Burj Khalifa stretches 2,722 feet (830 meters) above the city’s skyline. That’s nearly half a mile! Now, let’s journey to Dubai and explore the story behind all 160 stories. The Burj Khalifa seems tall enough to reach the moon! After discovering oil in 1966, Dubai’s economy became centralized around the production and exportation of this valuable fossil fuel. That began to shift in the mid-1990s — after the conclusion of the Persian Gulf War — when a wave of international foreign trading communities and corporations moved their businesses to Dubai. The income provided by this shift in demographics — as well as a global increase in oil prices — allowed Dubai to supplement its oil-based economy with one of finance, service and tourism. This wave of prosperity also inspired architects from around the world to create the iconic and awe-inspiring Dubai skyline. The Burj Khalifa certainly met those requirements! When it opened in 2010, the mega-tower instantly claimed handfulls of “world’s tallest” awards, including the world’s tallest building and the world’s highest nightclub. 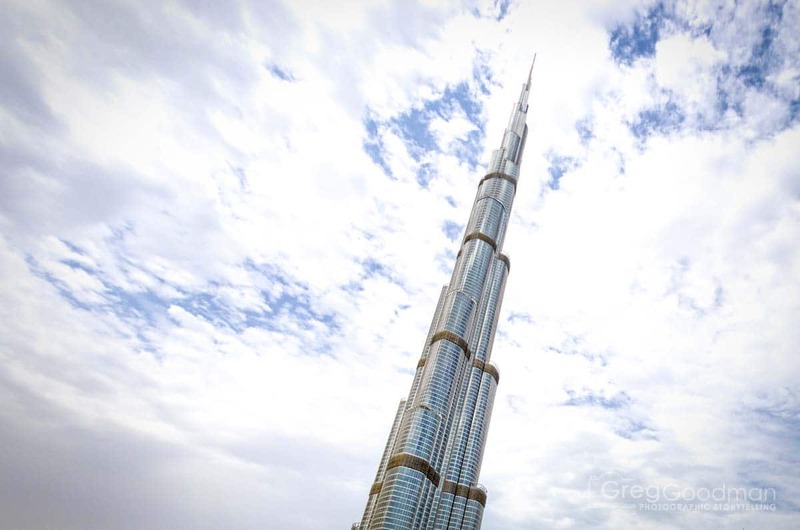 Looking up at Dubai's Burj Khalifa is liable to give you a stiff neck! Construction of Dubai’s Burj Khalifa took nearly 6 years (2095 days, to be exact). Work began on January 6, 2004, and the exterior was officially completed on October 1, 2009. Stunningly designed by the Chicago firm of Skidmore, Owings and Merrell, the Burj Khalifa is inspired by desert flowers and an unrealized Frank Lloyd Wright architectural project. Construction of the Burj Khalifa cost $1.5 billion … and that’s not counting the surrounding “Downtown Dubai” development. “The mainly south-Asian migrant workers have paid a high price for this ambitious project. Those workers toiled 12 hour a day, 6 days a week for pay as little as $4 per day. Growing up in New York City, I spent my childhood surrounded by tall buildings. As a result, it takes a lot to impress me. The Burj Khalifa took my breath away! From the minute you enter Dubai, the Burj Khalifa is visible everywhere. It towers above the skyline and can be spotted from almost every window, rooftop, subway line, highway and river. Upon arriving in Downtown Dubai and finding yourself face to face with this monumental colossus, all that’s left to do is crane your neck as far back as possible, look up and stare in awe. Breathtaking. Epic. Endless. Unimaginable. These are just some of the adjectives used to describe your view from ‘At The Top’ – the observation deck and lounge on the 148th floor of the Burj Khalifa. With 360 degree panoramic views, you can gaze out on the ultra-modern architecture of Dubai, the crystal-blue waters of the Persian Gulf, the vast colorless desert and the incredible divide between the city’s haves and have-nots. A visit to ‘At the Top’ isn’t cheap … but it’s worth it. Prices begin at around $50 and go all the way up to $150 if you want access to the VIP ‘At the Top SKY’ experience. The best time to visit ‘At The Top’ is sunset, when you can actually watch the sun dip below the horizon twice – once from a low floor, then again from the top. At any given moment, an estimated 50MVA of electricity is pulsing through the tower. That’s the equivalent of running roughly 500,000 100-watt light bulbs simultaneously. ³ Additionally, the Burj Khalifa’s spire is home to a large array of radio towers, satellites and other electromagnetic fields. In theory, all this energy is invisible. However, looking through my photographs of the Burj Khalifa, I noticed a shadowy beam cutting through the sky above the tower’s spire. The line was present in images from all sides of the building and appeared to change the color of the sky on either side. I can only surmise that the camera captured that energy coming into and out of the tower. That said, I would love to hear what you think in the comments below! True enough! You can easily spend an entire day exploring that square kilometer … which is a good thing, because the area surrounding it is hot, dry and under constant construction. The common areas of Burj Khalifa all have a bespoke fragrance that was selected from among 18 aromas. The fragrance with the materials in each space for a subtly different experience.